Cowpens (CV-25) was launched 17 January 1943 by New York ShipbuildingCorp., Camden, N.J., sponsored by Mrs. M. H. Spruance; daughter of ViceAdmiral W. F. Halsey; and commissioned 28 May 1943, Captain R. P. McConnell in command. She was reclassified CVL-25 on 15 July 1943. Departing Philadelphia 29 August 1943 Cowpens arrived at Pearl Harbor19 September to begin the active and distinguished war career which was to earn a Navy Unit Commendation. She sailed with TF 14 for the strike onWake Island on 5 and 6 October, then returned to Pearl Harbor to preparefor strikes on the Marshall Islands preliminary to invasion. She sortiedfrom Pearl Harbor 10 November to launch air strikes on Mille and Makin atolls between 19 and 24 November, and Kwajalein and Wotje on 4 December, returningto her base 9 December. Joining the vast carrier TF 58 Cowpens sailed from Pearl Harbor 16 January1944 for the invasion of the Marshalls. Her planes pounded Kwajalein andEniwetok the last 3 days of the month to prepare for the assault landingon the 31st. Using Majuro as a base the force struck at Truk on 16 and 17February and the Marianas on 21 and 22 February before putting in to Pearl Harbor 4 March. Returning to Majuro, TF 58 based here for attacks on thewestern Carolines; Cowpens supplied air and antisubmarine patrols duringthe raids on Palau, Yap, Ulithi and Wolesi from 30 March to 1 April. After operating off New Guinea during the invasion of Hollandia from 21 to 28 April, Cowpens took part in the strikes on Truk, Satawan and Ponape between 29 April and 1 May, returning to Majuro 14 May for training. 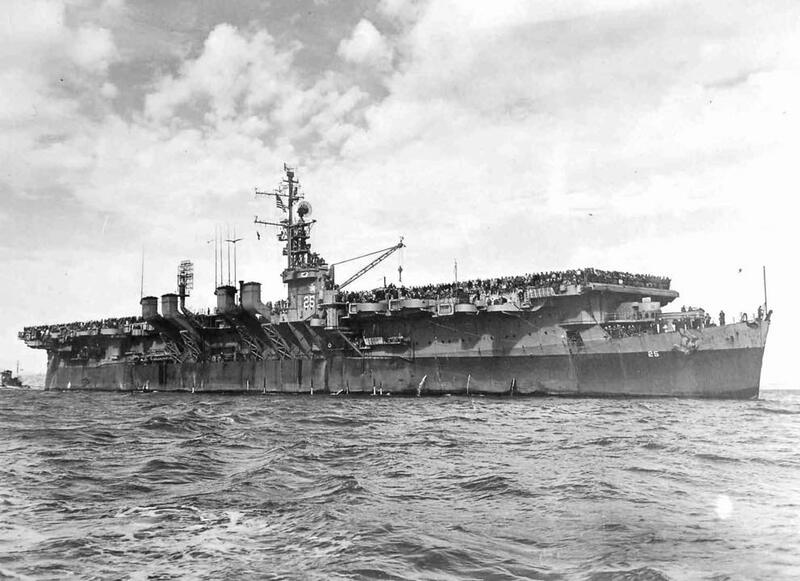 From 6 June to 10 July 1944 Cowpens operated in the Marianas operation.Her planes struck the island of Saipan to aid the assault troops, and madesupporting raids on Iwo Jima, Pagan,.Rota, and Guam. They also took partin the Battle of the Philippine Sea on 19 and 20 June, accounting for anumber of the huge tally of enemy planes downed. After a brief overhaulat Pearl Harbor, Cowpens rejoined the fast carrier task force at Eniwetokon 17 August. On the 29th she sailed for the preinvasion strikes on thePalaus, whose assault was an essential preliminary to the return to thePhilippines. From 13 to 17 September she was detached from the force tocover the landings on Morotai, then rejoined it for sweep, patrol, and attack missions against Luzon from 21 to 24 September. Cowpens with her task groupflew strikes to neutralize Japanese bases on Okinawa and Formosa from 10to 14 October, and when Canberra (CA-70) and Houston (CL-81) were hit bytorpedoes, Cowpens provided air cover for their safe withdrawal rejoiningher task group 20 October. En route to Ulithi, she was recalled when theJapanese Fleet threatened the Leyte invasion, and during the Battle of SurigaoStrait phase of the decisive Battle for Leyte Gulf on 25 and 26 Octoberprovided combat air patrol for the ships pursuing the fleeing remnant ofthe Japanese fleet. Continuing her support of the Philippines advance, Cowpens'planes struck Luzon repeatedly during December. During the disastrous typhoon of 18 December Cowpens lost one man, planes and equipment but skillful workby her crew prevented major damage, and she reached Ulithi safely 21 December to repair her storm damage. Between 30 December 1944 and 26 January 1945 Cowpens was at sea for theLingayen Gulf landings. Her planes struck targets on Formosa, Luzon, theIndoChinese coast and the Hong Kong-Canton area and Okinawa during January.On 10 February Cowpen' sortied from Ulithi for the Iwo Jima operation, strikingthe Tokyo area, supporting the initial landings from 19 to 22 February, and hitting Okinawa on 1 March. After overhaul at San Francisco and training at Pearl Harbor, Cowpenssailed 13 June for San Pedro Bay, Leyte, on her way striking Wake Island on 20 June. Rejoining TF 58 Cowpens sailed from San Pedro Bay 1 July tojoin in the final raids on the Japanese mainland. Her planes pounded Tokyo,Kure, and other cities of Hokkaido and Honshu until 15 August. Remainingoff Tokyo Bay until the occupation landings began 30 August, Cowpens launched photographic reconnaissance missions to patrol airfields and shipping movements,and to locate and supply prisoner-of-war camps. Men from Cowpens were largely responsible for the emergency activation of Yokosuka airfield for Allied use. Between 8 November 1945 and 28 January 1946 Cowpens made two voyages to Pearl Harbor, Guam, and Okinawa to return veterans. Placed in commission in reserve at Mare Island 3 December 1946, Cowpens was decommissioned 13January 1947. In addition to her Navy Unit Commendation, Cowpens received 12 battlestars for World War II service.